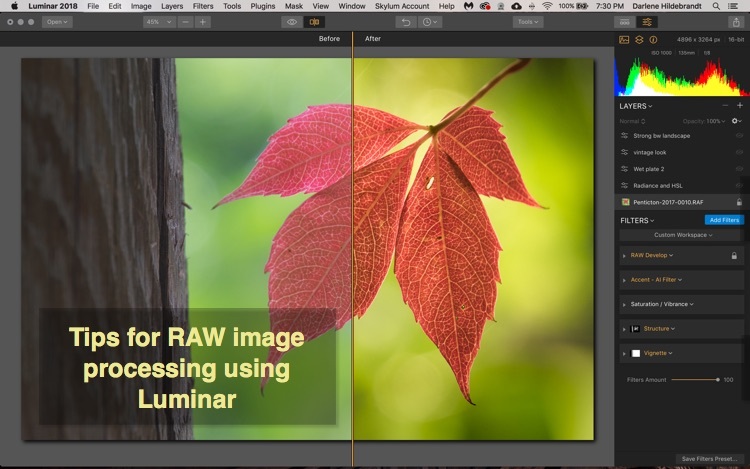 Recently I wrote part one of raw photo editing software comparison. If you missed it, you can get all the details here (there was quite a discussion that ensued in the comments on that one, go check it out). In part two, I will go over another four, this time including Photoshop CC. Note: There will be a Part Three later down the road! Tell me if I've missed any programs by commenting below and I'll add them to my growing list which already includes Photo Lab by DxO, PaintShop Pro, Capture One, and possibly Pixelmator. Just to give you a reminder of how I've done these reviews. I will give you some of my thoughts and initial impressions of each program as well as rate them in eight different areas. I've approached this software review from the perspective of a total beginner. I wanted to see how intuitive each program was when I opened it. Having over 20+ years of using Photoshop, Lightroom and various pieces of other photo editing software – I figured if I can't figure it out easily (and need to watch 4-10 hours of video tutorials just to get it), what chance do you have? Photo editing softwarew comparison chart – Click to view full size. There is no dispute that Photoshop is the master of all photo editing software. It can do pretty much anything to your images if you know how to drive it – but therein lies the trick! It comes with a very steep learning curve. I have been using it for nearly 20 years and I do not know how to use every tool, or anywhere near everything that there is to know about it. I use the tools I need and that's all. You can do really cool stuff like this with Photoshop. 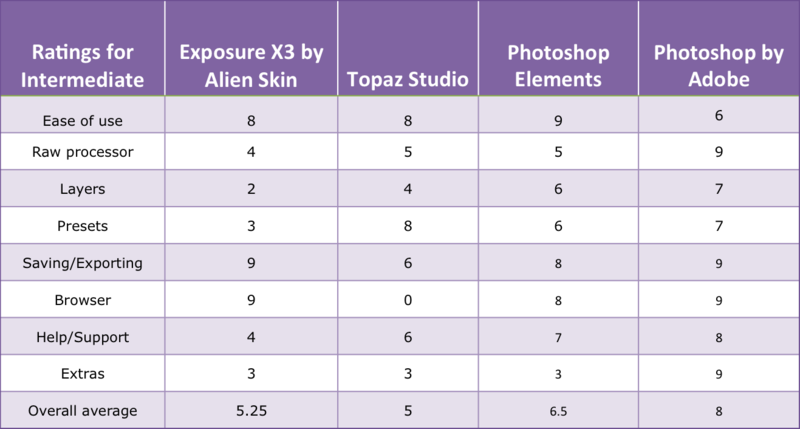 Let's look at how I'd rate Photoshop in each of the categories. I can sum this up in one word – NOT! Photoshop is not easy, especially for beginners. There is no “start here” or handy presets you can push and be done. Camera raw is pretty easy to get a handle on but once you open your image into Photoshop you need to know how to use Adjustment Layers, masking, other tools and why as well. You can't just play around until you get something you like, you need to have a plan and Photoshop will help you execute that. But just winging it could take hours at worst or at best cause a lot of frustration. For intermediate to advanced users, Photoshop may be what you need to bring your visions to life. But there are also simpler tools available. 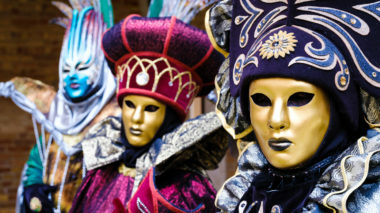 Adobe Camera Raw (ACR) which is built into both Photoshop and Lightroom is a great tool for processing your RAW images. It is the one with which I am comparing all the other programs, to see if they measure up. So yes, Photoshop still has one of the best photo editing RAW processors available, in my opinion. Layers in Photoshop is the basis for non-destructive editing. That means you are never working on your original file, all edits are done on layers on top of your image so they can be altered, manipulated, or deleted at any time. I added the image of Che Guevera to the other photo of the man on the stoop using layers in Photoshop. You can also adjust things like the Layer Blend Mode and add a mask so that only part of the adjustment layer shows through in the final image. So using Layers is a powerful editing tool in Photoshop. But again it can be tricky to get your head around how they work, and the learning curve is steep and long. I know many people who just cannot get the hang of it. There are no Presets in Photoshop per say – it uses something called Actions which are a series of recorded steps which are applied to your image. You can make your own Actions or purchase them. They are a bit harder to use than one-click presets as there are often settings you need to make while the Action is running and they may often create multiple layers with the added effects – so once again you need to know how to use Layers to get the biggest benefit from Actions. You have two options for saving images in Photoshop – Save and Save As. Save will write over the original file in the same format unless you've added layers. Then it will normally default to saving as a PSD file. Save As allows you to save a copy, choose the image format and rename the new file if you want. There are other options as well though such as Save for Web and Export which will give you a lot more options for resizing, crunching, and naming your image. The browser for Photoshop is actually a separate program called Bridge. It allows you to view, sort, flag, tag and cull your images. You can apply bulk actions like renaming in Bridge, as well as run an Action on an entire set of images such as “Resizing for online use”. You can customize how it looks and what information is shown at any given time, as well as the size of the thumbnails. The Essentials browser view in Bridge showing one image that is flagged and rated 5 stars. The Metadata view in the Bridge Browser. The only thing it cannot do is show you images which are on offline hard drives (only Lightroom has that ability due to the catalog and the images being indexed as previews). There is a LOT of training available for Photoshop. Other industries besides photography use Photoshop as editing software too such as graphic designers, computer techs, bloggers, etc. Adobe's site has many tutorials and experts that teach Photoshop and you can find many online and in-person classes for it, probably even some in your area if you're in a big city. As I mentioned with Lightroom though, this is both a pro and a con. Yes, there is a lot of help and support for it, but on the other side of the coin, you may need a lot of help. More so than with some of the other simpler programs. So if you want to learn Photoshop, expect to invest a fair bit of time doing so. This is where Photoshop excels and does many things that other programs do not such as; HDR, stitching panoramic images, focus stacking, 3D rendering, liquify, puppet-warp, editing for video, working with Vector graphics, text, texture overlays, borders, composite images, head swapping, and pretty much anything you can imagine. Focus stacked macro image for maximum depth of field and sharpness. For beginners, it is likely a lot more than you need. 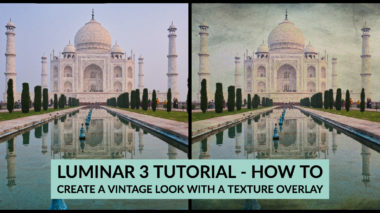 For intermediate and advanced image editors the sky is the limit! Overall do I think Photoshop is still the standard? Yes. Do I believe it is the best option for beginners? No. If you want to do advanced techniques and enjoy learning new things – then the best photo editing software for you may be Photoshop and Lightroom. But do expect to spend a significant amount of time learning how to use them properly. You can pretty much achieve any effect you want for your images with Photoshop. It's super creative, super flexible, and has many photo editing tools to get the job done – sometimes in different ways to get to the same result. The monthly subscription fee can turn people off, and if you don't want to pay that you can't have Photoshop. It's also a big commitment to learn how to use it and can cause frustrations along the way. So if you aren't prepared to take a class or two, do some reading, and watch many, many online video tutorials – Photoshop is mostly like going to give you fits. The first impressions of Exposure X3 by Alien Skin were good. I opened easily into the image browser window. I found it easy to navigate and figure out. There are some good customization options in the preferences so you can set up the screen layout how you like it, even work with two monitors – I do that and it was very easy to do and handy to use. Out of the box, Exposure X3 is pretty easy to use. The interface is pretty intuitive. On the left panel, you have folders where you can find your images, and presets that you can apply to them. 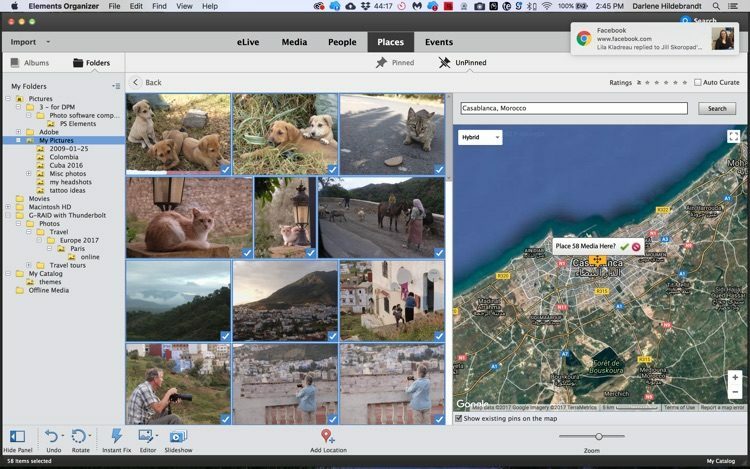 In the middle is the image browser window and on the right side are the image processing tools and layers. So if you want to get a nice look for your image in a few clicks it’s pretty easy to do that with this program. If you like the look of film, (if you remember those days!) then you will likely enjoy working with Exposure X3. You can also use Exposure X3 as a plugin for Lightroom or Photoshop (possibly for others but those are the ones I have installed). So if you continue with your Adobe subscription and enjoy the look of film – this is a good option as an add-on to your LR workflow. The Raw image processor in Exposure X3 has some things that impressed me and is missing a few other processing tools that I had expected. What I liked is that the familiar Alt-click and hold on certain sliders in the basic adjustment panel shows clipped areas on the image – as it does in Lightroom and I’ve come to expect as I use it a lot. You can also even grab an area of the histogram and just drag it and the corresponding slider will move in response. There is also an eye-dropper for doing custom White Balance. Things I found missing were any method for correcting Chromatic Aberration (a search in help finds nothing), no perspective control for lens distortion (just one slider for distortion). It did find and automatically correct for my Fuji lens but there are no other controls to adjust it manually. That part is pretty limited. Lens Correction panel – this is it. I also found that the black and white conversion was a bit odd and not so adjustable. You simply click Black and White on the Basic panel, but it doesn’t show you what’s happening to the image there. You have to go to the Color panel where you can adjust the individual sliders. But there is no targeted adjustment tool so you have to play around with them a lot and they don’t do much to the tones in the image. There are options you can pick for Color Sensitivity but again you have to play around quite a bit to get what you want. I think with time you’d get a handle on which to use when but it’s not intuitive right away. This is what happens when you click Black and White. Looks like nothing. You have to go to the Color sliders (not intuitive when doing b/w) to adjust the tones. This is the best I could do for black and white conversion on this image. Finally, local adjustments (things you do to only part of the image) are very limited. There are only a few available that you can brush in or add as a graduated filter, and masking features are limited. For example, if you choose “Burn (Darken)” there are no sliders to say how much or to apply only to highlights, or shadows. It just darkens and you can only adjust the brush flow and the layer opacity. There is no luminosity masking, by color, or find edges. This is it for local adjustments available in Exposure X3. However, having said that, I think it would be fine for a beginner or someone who does not want to do much to their photos. An intermediate user may soon get frustrated by its limitations. Exposure X3 does use layers but not in the same way you’d expect like Photoshop or other programs. You cannot simply add a layer with a new image on top, or if you can, for the life of me I can’t figure out how to do it. You can layer your effects so you keep your edits non-destructive and add things like a texture overlay or grunge border. But don’t expect to change the sky, combine two images or do a head swap with this program. The presets in Exposure X3 have some pros and cons. The good thing is there is a lot of them! Another aspect that could be either good or bad depending on your own preferences – is that all the presets are based on film. They replicate the look of many popular negative and slide films from back in the day. If that is not your thing you will find many of the presets basically useless. Many of them apply a lot of grain to the image (which you can edit but it gets a bit annoying after a while), heavy color effects, or a faded look with light leaks or cross processed. When you hover your mouse over a preset (in the red box above) the Navigator window shows how it will look on your image (blue box). Or you can select “Audition” in the top toolbar (green box) to show up to 3 presets compared to the original image (yellow box). So if you just want to enhance your image, finding a preset that works well will take time to go through them all (in 19 different categories – there is a preview of each but you have to open each one and scroll through them so it’s time-consuming) to find your favorites. It does have a cool feature that lets you “audition” up to four different presets side-by-side and then pick the best one (see screenshot above). Saving or exporting images from Exposure X3 is fairly straightforward. Just select File > Export and this dialog box will pop up. Export popup. 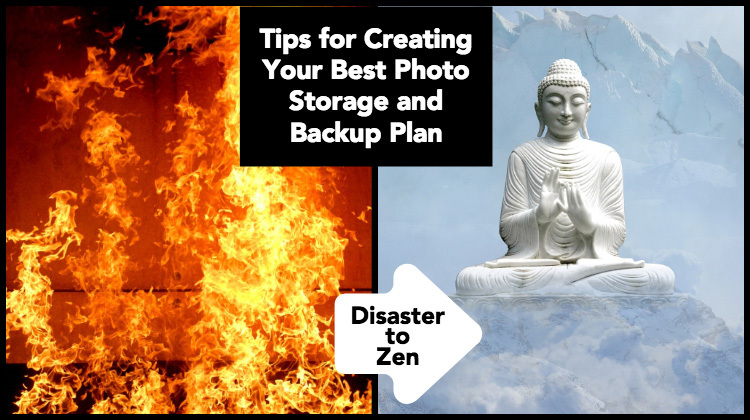 There are 5 settings you choose here – where to save the image, the naming structure, the file type and quality, metadata to include, and image size. There are a few presets for size and each of the 5 options gives you the option to save your settings as a preset. You can also export directly to these platforms from Exposure X3 and it sizes the image accordingly for you. The image browser component is well-done in Exposure X3. You can quickly and easily navigate to your images and the program draws the thumbnails fairly fast as well. There is no need to import images, it will see them if you point to the folder where they reside. I can do the usual stuff in this window like rate, color code and add flags to your images for easier sorting. You can also create Collections to further sort and group similar images together such as flowers, or landscapes. They contain virtual copies of your images so won’t fill up your hard drive. Browser window in Exposure X3. Browser as seen on my second monitor. Exposure X3 works nicely with two monitors so you can always see the image large and all your tools on the other screen. There is not much missing here, so it gets high marks in this category. There are a couple nice things in the area of support for Exposure X3; a Facebook group for users which seems full of engaged and helpful people, and a page of online tutorials. I have to say after looking at several different support and tutorial pages, that this one is the best organized. It actually has the videos sorted into different categories like; Getting Started, Organizing, and Editing. Each one is fairly short but helpful in understanding one new thing about the program. I cannot find a written PDF guide, or very many online articles about this program though. Not on their site or anywhere. It just doesn’t seem that widely used yet so finding a class or course on it could be difficult. NOTE: Exposure X3 emailed me when my trial expired and offered an extension of another 30 days if I wasn't sure yet. That's a nice bit of service! The first thing I looked for in all the programs I’ve tested is whether or not they can handle the two most common extra functions – HDR and panorama stitching. What it does do, however, is texture overlays, grunge borders, bokeh blur (to blur the background or make tilt-shift looks), and IR (infrared) effects. It even comes preloaded with textures and borders so creating grunge masterpieces is fairly easy. The three types of Overlays you can apply in Exposure X3 – borders, light effects, and a texture. There are plenty built-in to choose from. The final image with the overlays applied. Well, the things Exposure X3 does well is film effects, of that there is no doubt. So it would make a great plugin for LR or PS. But I'm not quite sure it's there yet as a stand-alone raw post processor. Besides the things I already mentioned above, it was really slow to work on images that are located on my external hard drive. I could hear it spinning non-stop and working hard and the edits took a while to apply each time I clicked a preset or moved a slider. The bottom line with Exposure X3 photo editing software is that it does some funky and cool effects if you like grunge images, but I just don't think it's there yet as an overall raw image photo editor. Topaz Studio is the newest product in the Topaz lineup. They've made really good plugins for several years now, and with Studio they're taking it into a stand-alone raw processor to compete with the big boys. I've used several of the older Topaz plugins like Adjust and Simplify and found them to be quite good. It seems those are now gone and Topaz Studio is now their flagship product. The interesting thing about the Topaz photo editing software is – Topaz Studio is free! 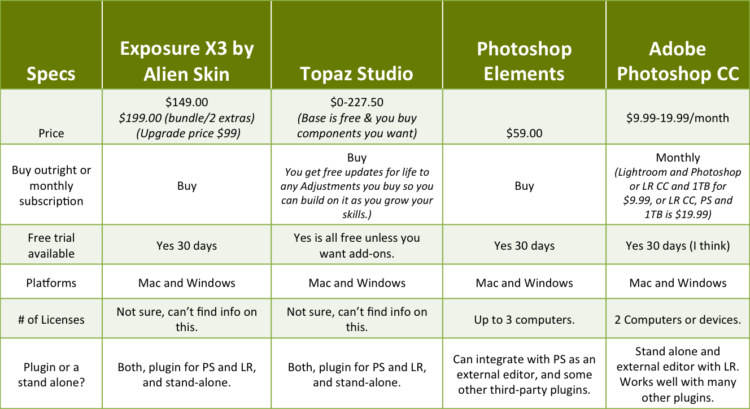 You can download and use Topaz Studio with 10 free “Adjustments” – forever. So if you like those 10 free presets, you're all set! When and if you are ready to upgrade or want more features you can just buy the individual components that you want one at a time such as HSL Color Tuning, Focal Blur, Precision Detail, Quad Tone, Sharpen, Reduce Noise, Texture and more. If you buy all of them (you get a 50% discount) it will cost you $227.50 at the time of this writing. But here's the trick – you own them forever and get free lifetime updates! So you never have to pay ever again (that's the idea anyway, but I'm sure they'll release new things down the line to entice you to get too). It's an interesting model for sure and I'm keen to see how it plays out. “When you purchase an Adjustment, you will own that Adjustment forever. 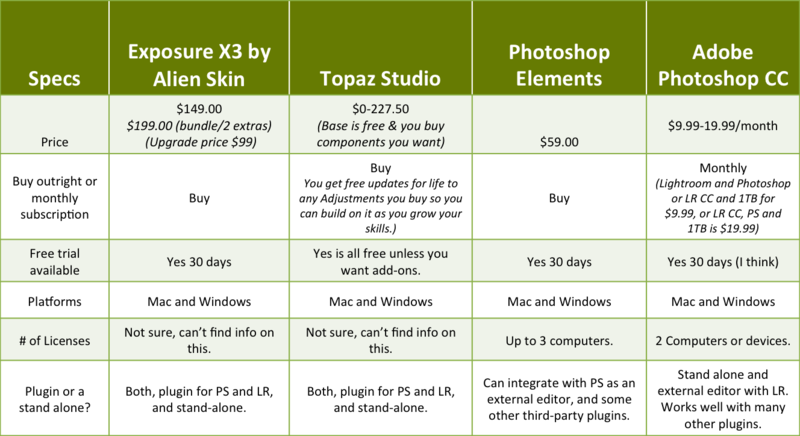 If we update that Adjustment with new features, you'll get those for free, as well (it's the Topaz way!). Topaz Labs stands by its policy of providing customers free updates for life.” From their FAQ page. I find the Topaz interface quite simple and easy to understand and use. On the top left of the screen is a big question asking you, “What do you want to do?”. You have several choices from Basic to artistic, and after making your selection you are presented with a set of presets. Does get simpler than that, right?! The presets are good, really good. Many times I clicked on one and was really impressed with it right out of the box, without any tweaks. So if you want a program that you can be in and out, and enhance your image in under 5 minutes, this might be the piece of best photo editing software choice for you. Once again I pulled this challenging JPG out to see how Topaz could handle it. With just one preset and couple minor adjustments, I was pretty impressed. There are not a lot of basic adjustments for raw and it took quite a long time to open one raw file. A few of the things I found lacking are; no clipping warnings, no history (just undo and you can’t see the steps), no black and white sliders or targets in that adjustment so it’s limited. However, having said that, some of the presets for black and white are quite good. There is just not a lot of options for tweaking it. Here is the same image I used in part one of the software comparison, processed using Topaz Studio from the raw file. Pretty nice, actually. This is what happens when you do black and white though. You need to buy the Pro module to get color sliders, which at the time of this writing is $14.99. To me, it's pretty useless for b/w without it so this would be one I'd add on. The “Pro” Black and White adjustment sliders, way more options for tone control. This is the best I could do for black and white photo editing without the Pro sliders. The same image using the Pro Black and White adjustments. For any of the “Pro” adjustments, you can do a 30-day trial before you have to decide to buy it or not. Then if you want it you just click the “Go Pro” in blue at the bottom of the panel, it will take you log into your Topaz account, bills you for it, and automatically unlocks it – no access or unlock codes are necessary, really easy. Just go back and keep using it. Lens Corrections is hidden under “Tools” and is either auto or all manual. This photo editor froze and crashed once when I tried to add the pro trial for one of the adjustments. The Highlight and Shadow sliders are either really poorly done, or just go WAY too far. Below you see another image, with the best post processing I could do in Topaz Studio, and what happened to it when I pulled both of those sliders all the way. I have resized this image to 750px wide twice and saved it twice and the program keeps making it 675px wide. Highlight slider – not so good. This is a raw file, there is more detail than that and it shouldn't do this. FYI this is NOT desirable! Yes, Topaz Studio has layers, but once again the functionality is limited. You can add an image as background or foreground and mask or blend them together. I only played with this feature a little bit. It took me a while to figure out that in order to add an image as a layer you have to first open it into Topaz Studio. Then you can drag from the thumbnail – you cannot do so from your computer onto the layer. Getting things lined up for image blending doesn't look easy – there is no “align layers” as in Photoshop. There is also a Texture adjustment you can purchase as a pro add-on if you only want to do texture overlays. It's not cheap though, at $39.99. The presets in Topaz Studio are plentiful and have lots of variety. You can do everything from basic natural adjustments, HDR, and vintage looks with grunge borders and textures. This is one-click to get this look. You can then tweak it using the adjustments applied, lower opacity, change blend modes, masking, etc. You can save your own presets under “My Effects” but you do not get to choose which adjustments get saved, it's all of them. There is also no way of knowing later which effects are saved in each preset, unless you name it and list them all in the name. One quirk I noticed is that if you just click on a preset category name, it applies the first one automatically – whether you intended to do so or not. It overwrites all your edits. So I'd recommend using the “Duplicate” which makes a new project and applies all your edits, then you can go back if you want. If you hit save when working on a JPG it seems to save over your original with no warning. I save a smaller size JPG over an original which means it’s gone. There is no export function, just Save As. There is also no way to resize when you’re saving, you have to resize first and then save. I can see there is a danger of accidentally saving a resized image. Save lets you save a TSP native file format. You cannot control file size when saving – it gives you a few quality choices, but doesn’t give you any options for file size. Saving your settings as a preset isn’t an option either. I also find that sometimes that images come out sharp, sometimes they are blurry – like this one. All I did was resize to 750px and save it. Blurry – it was sharp on the screen before I saved it. Note: I also found that if I applied the Sharpen adjustment on the full-sized image and then resized for 750px for the web, the sharpening was way too strong and I had to scale it back. So you have to do all your work, save the project as a “.tsp” file, resize, and then add sharpening last to the final output size. This is similar to working in Photoshop. So while the save options are simplified, perhaps it has gone too far. It’s likely more advanced users will find it too simple and not enough options. The simple answer here is, there isn’t one. There is no way to see your images, sort or rank them. Just open and work on one at a time. They have a help page, 32 videos and 22 tutorials on the Topaz Studio education hub. There is also a Facebook group for Topaz fans so you can ask questions of other users. I find Facebook groups to be extremely helpful as you can often get your issues solved in minutes, as opposed to waiting for a reply to a support ticket. But if you need more help than that, there isn’t much else. No courses and you’re unlikely to find a local class or tutor to teach you this program. The only extra in the Topaz Studio photo editing software is really just texture overlays. It cannot do multiple image HDR merges, panoramic stitching, focus stacking or more advanced things like those. You can add an image layer but those are just for blending or combining images so is really for more advanced users. In my opinion, there are two big pros of the Topaz Studio program. First, that you can use it for free unless you want to add any of the Pro adjustment options. So there is no risk, nothing to lose. Even if you do buy the Pro components, you own them forever with free upgrades. Again, no risk, and it will cost you nothing next year. So if you just get the ones I recommend you'll spend $84.95 ($124.94 if you get Texture) and never spend another penny (unless you add more). Second, it’s super simple to use, especially for beginners. So if you fall into that category, I suggest you give it a try. As you learn and grow and your skills expand, there is room for the program to grow with you. Eventually, if you feel you have outgrown it, you can still use it as a plugin for LR or PS. The cons I can see with Topaz Studio are that it is somewhat limited, and the raw processor itself is missing a few essential elements. But it will be interesting to see where they take it in the next 12 months or so. If you use this photo editor as a plugin for either LR or PS, then Topaz Studio has some creative potential. But as of right now, the raw processor itself has a way to go before it can replace LR or PS, in my opinion. Photoshop Elements is like the little sister of Adobe's full-sized Photoshop. It does a lot of the same things, in similar ways, but it comes with training wheels if you need help. I've helped some of my students use Elements and figure out things like layers and masking in the past (they are similar enough to Photoshop that it was fairly intuitive for me to do those things) but I've never actually processed any of my own images with it. I was told that it has a great interface for beginners and even offers guided editing – which it does and I will talk about below. Overall, for the price, it's actually pretty good. Even in the “Expert” mode though, I think an intermediate user will outgrow it quickly – and I might even take back my recommendation of Elements over Affinity for those photographers. More below. As promised, when you open Photoshop Elements you're greeted with a welcome splash screen where you have to choose from the following three options: Photo Editor, Organizer, Video Editor. The Organizer comes with Elements but if you want to edit videos, then you have to purchase that separately for $69.99. If you choose Organizer you are met with a screen that looks like the one below. There are no images showing and it's not immediately apparent how to get them to show up. You have to “Import” the images, although I'm not sure where they are being imported to, and how Elements is using them. More on this later uner the Browser heading below. If you choose Photo Editor, it will open a dialog box where you can find your image. Or you can choose Organize, and it will launch the Organizer anyway. It's very similar to working with Photoshop and Bridge. They are two separate programs that work together. One to display the images, one to edit them. Once you have an image opened you once again have three new choices, this time for workspace. This is where Elements excels for beginners. If you have never used any photo editing software before you can choose either Quick or Guided. See below. Photoshop Elements Quick workspace. Here you have only a few adjustments on the right-hand panel, limited tools on the left-side, and a few effects in the lower right corner. Each of the adjustments has an Auto button and limited options so you can be done in a few clicks. Note: I did find one thing that was odd and annoying in Quick mode. Once you make any of the adjustments, for example, Lighting, and move down to make a different one, the one you changed is now set back to zero and you can't change it. Doing so just gets weird. You have to either find the history and go back a few steps (not a beginner thing) or reset it and start over. After I moved down to Color, the settings above all read “0” again. Elements Guided workspace. Here you can select one of the six main options: Basics, Color Black & White, etc., and inside each, you have additional choices. Whichever final options you choose it will guide you through all the steps and ask you what you want to do when you're done (save, continue editing in Quick, etc.) Makes it pretty easy to follow indeed. If you are more experienced with photo editing, use the Expert workspace which looks very much like a scaled-back Photoshop window. Tools in the left, Layers on the right, and Effects and Filters at the bottom. There are also some hidden editing tools in the menus which I had to discover – more on this under Raw below. Here is an image shot in JPG and processed using both the Quick method and Expert. True, the Expert one takes it a bit farther with an edge vignette, but if you just want quick and dirty, the Quick one is pretty good. Processed using the Quick workspace. Processed using the Expert workspace. An edge vignette was done using a masked adjustment layer, and a Highpass Filter was used for added sharpness. So, I'm giving the Elements photo editor almost full marks for ease of use. The software makes it easy to open and go, regardless of your skill and experience level. Notice, this rating is for ease of use – read on for more, especially for intermediate users. Okay, the raw processor. When you open a raw file in Elements it launches what looks like the regular Adobe Camera Raw window. I say “looks like” because there are a few things missing. You can do your basic adjustments, and the sliders will look familiar if you use Lightroom or Photoshop now. The Alt-click trick works on most of the sliders as well to show clipped areas of the image. Well, a bunch of stuff. Looks at the difference in the tabs. Tabs in full Photoshop – Adobe Camera Raw – all 10 of them. Tabs in Photoshop Elements – only 3 of here. And all of the local adjustment tools like the Brush, Radial Filter, and the Graduated Filter. So at first glance, it looks the same – but dig around under the hood and it's not. For beginners, this is probably a good thing, but for those of us more experienced I think there's a lot that is missing that should be in there somewhere. The ones I feel are essential are Lens Corrections (I cannot see Chromatic Aberration removal in Elements anywhere), HSL (I use that a LOT), and Post-Crop Vignette which I pretty much apply to every image in some form. First, it takes quite a while to open one single raw file. I've heard people complaining about other programs that have this same issue (like Luminar) but I found Elements to be particularly slow for me. Secondly, when both Organizer and the editor are opened my computer seems to be working really hard. I could constantly hear the fans whirring away and it got quite hot. I'm not sure why but Elements is using a lot of resources and I have not found that issue with any of the other programs I've tested. But, does it do a good job? Yes, it does. After photo editing with Elements. How to do Black and White conversions took me a while to figure out. So I used the Guided option to see what it could do. I got this result – not bad. But it was not really editable after it was applied. Most of the stuff you do in the Guided module gets added as a new layer. I expected Black and White sliders to adjust the tones, but nope just a layer. Black and white using the Guided option. The other tricky thing that was hiding was the Lens Correction and Distortion control. Because this image was shot with a fairly wide lens the buildings look as if they are tilting backward. Distortion corrections can fix that. I looked in the Raw processor options, on the Adjustment layer choices, and the Effects and Filters – nada. I finally gave in and searched their help page for it and discovered it hidden in a menu at the top, and not the one I expected. I thought it might be in here – nope. Aha! Not at all where I expected Lens Corrections to be hiding, under the Filter menu. I would not call that a filter, would you? It's a pretty rudimentary adjustment and you have to do it manually and judge visually. There is a grid overlay you can turn on to help. I was able to correct it a bit and get this result. Convert to black and white was under the Enhance menu. As you can see there are a lot of options here. I just did not expect Convert to Black and White there. I looked for it as a layer adjustment. The B&W conversion dialog box. The previews are really small and your image is in the background. The sliders are really touchy and not easy to adjust. It is a bit finicky. Distortion corrected and the Black and White conversion panel used. A nice conversion. BUT . . . once it was applied, there was no way to go back and adjust it. I looked for a way to make the layer a Smart Object like in PS, no such thing that I can see. No way to double-click the layer and edit the settings. AND it applied it directly to the image, not a new adjustment layer. So unless you know to copy the layer first and convert the duplicate layer to b/w, your color image is gone. That is not non-destructive editing. It did do a decent, if not one of the best jobs on this JPG file. This was done using Guided and Quick workspaces of the photo editor. I could probably do a better job if I masked the sky to get rid of the halo that you can see around the guy. But it's not bad for a quick and dirty processing job. My ratings below are based on the fact that I think beginners will have a fairly easy time processing raw files. But as your skill level increases and you learn a few things and want to do more, you'll likely outgrow Elements. Yes, you can do layers in Photoshop Elements. There are options for Adjustments Layers, but less than in full Photoshop. These are the only options. You can also duplicate a layer, add new blank one, or place another image on top as an overlay (for sky replacement, textures, etc.). Blend modes and masking are also available for layers. The Text Tool in this photo editor can add words to your images and you can add drop shadows and other effects using layer styles, as you can in Photoshop. Layers in any photo editor, in my opinion, can be challenging for beginners. But here's the neat thing about Elements, you never have to even look at them if you don't want. Just use Quick and Guided and let the program do the heavy-lifting for you. A few layers I added to adjust this image. In order going up are; the base image layer, Brightness/Contrast, Hue/Saturation, Levels, and another Brightness/Contrast adjustment layer, masked to act as an edge vignette. Before the adjustment layers were applied, this is the Raw processor only. One thing I found rather odd about Elements is that most of the adjustments cannot be done on 16-bit images. So if you do all the work to shoot Raw and use Adobe RGG Colorspace, when you open your high-quality 16-bit image into the Editor you have to convert it to 8-bit before you can really do anything. I fail to see the point, as you've already lost half your data. Elements does not work in 16-bit, disappointing. This one is gonna be short. There isn't really any presets per say in Elements. If you want to use one-click looks then you're into the Guided module. There you will find many different options. For example, you can make a collage or do funky effects. If this is your thing, there are plenty of options along this line in Elements. The Guided Effects Collage module. You just make the choices as indicated on the right, click Next, and then go back to the main editing window. But if you want to get more advanced than that, I'm afraid I can't see any other options. There are Actions like in Photoshop, but it doesn't come with very many preloaded. However, a quick Google search will find many Actions for PSE (Photoshop Elements) available for free or purchase. I tried using some of the convenient Share options for exporting and automatically resizing images. I had limited success and found some of the options overly complicated. The Email one doesn’t just pop the image into an email for you, where you can easily access your address book and send it. No, it makes you add a new contact then hops over to email. Why recreate your address book inside Elements, makes no sense. It also didn’t work for me – I chose the Medium size (800×600) and it put a really small thumbnail in the email only. Might be a Mac mail thing but LR does this and it works fine and both are Adobe products. 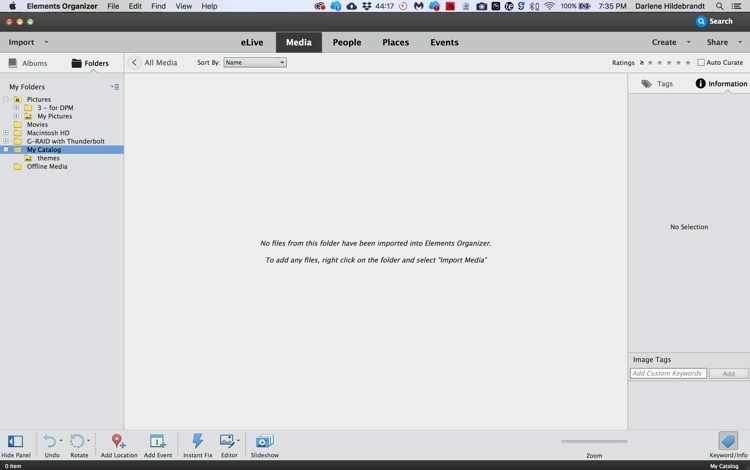 The Share by email dialog box. The Facebook share was really hard to log into and authorize. The other programs seemed to be able to do it automatically. Maybe this is better for security, who knows, but it was definitely not easier. The size it used was 1200×800 pixels, not optimal for Facebook which wants 2048 px wide. The Create Facebook Cover option worked pretty well though – even gives you instructions on what to do once the images are uploaded to Facebook. Pick your images and the layout you want then just drop them into the template. Super easy. Elements uploads your images and then tells you what to do next. PDF slideshow emails the file. Not what I was expecting, I thought it would offer an option to save to my computer. But then again, it was under the Share button! The Picture Package opens all the selected images and makes a layout in Element Editor with them all. But if you use RAW files it asks you to convert them to 8-bit first. It also took a REALLY long time for just 6 images. Then it almost crashed my computer and it opened them all in ACR for processing first. Again LR does this way better – not sure why Adobe makes things so different in Elements. Then I tried again with JPGs, it was not intuitive so I just quit. You have to make your own layout and it’s not readily apparent how to do that. Picture Package was not at all intuitive or simple so I bailed on this one. The Contact Sheet option was pretty straightforward but it took almost 3 minutes to build one with 9 images. 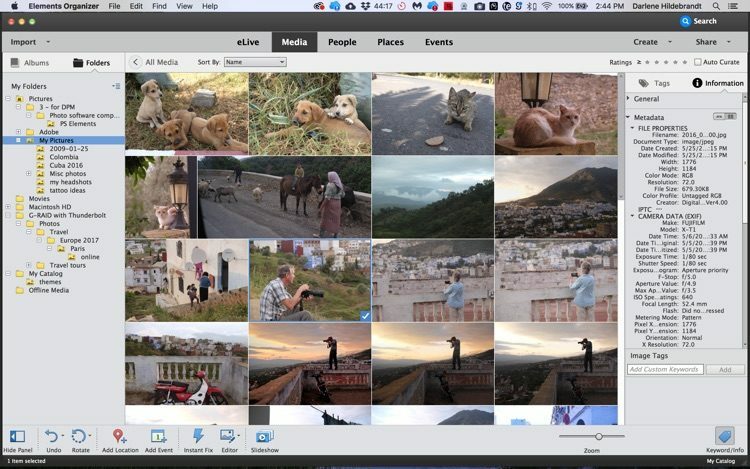 It opened the Elements Editor and all the images and made the contact sheet like a collage. But it left all the images opened, and the contact sheet had only two layers – white base layer and one with all the images (not each on a separate layer). Contact sheet created. If you had dozens or hundreds of images you wanted to make contact sheets with, that function could take hours in Elements! Go get a coffee or turn on Netflix! There is the nice familiar “Save As” option in Photoshop Elements. Once selected you can choose the image format and where to save the image as expected. Something that is familiar from regular Photoshop, is the Save for Web option. It makes it really handy for resizing images for a blog post, or sharing online and saving all in one operation. I would use this option, but if you don't know how to use it or what the settings and options mean, it may be hard to figure out. As I’ve already mentioned, the browser component of Elements is a separate program. In order to see any of your images in the browser window, you need to “import” a folder. It’s not clear why you need to do that (you don’t in Adobe Bridge that comes with Photoshop) and it took a really long time. One folder of about 2000 images took 2.5 minutes and then it was “analyzing” for a full 30 minutes looking for Faces and I’m not sure what else. I found it slow to read and draw the raw files in a folder of 400 or so images. There is an “Offline” folder and it has instructions how to add images there, but I tried it and still nothing. If I had to import my entire drive of images that would literally take hours. Elements Organizer window showing one folder of images. Notice you cannot see all my folders and images – only the ones that I “imported”. 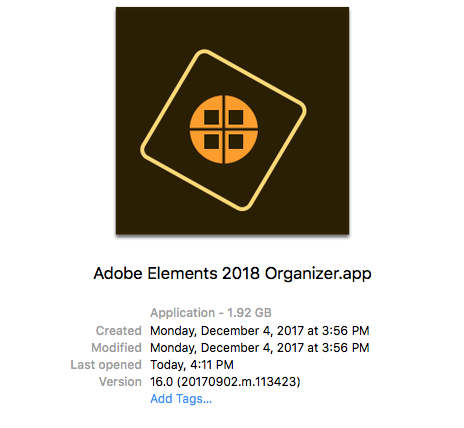 Elements 2018 Organizer is a separate app/program as you can see. And it's a large file! I thought maybe it was so big because it was cataloging my images, but this is the program size! The Elements 2018 Editor file was about the same size. You can add star ratings to your favorite images, edit and view the metadata, and enter the Editor from Elements Organizer. 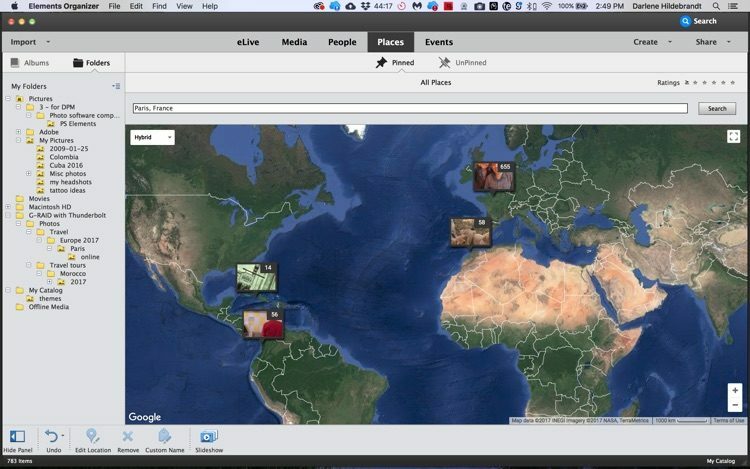 You can also add location geotags, face recognition on people you know, and more. Most of the things you’d expect. Adding a location or geotag to images is fairly easy. Just select them all, search for the location, and click the checkmark to add them. A few folders of my images placed on the map. Now I kinda wanna do them all to see my map! There are help and support pages for Adobe Elements and several video tutorials. You’ll find a User Guide and a forum where you can post questions and other users will help you solve your issues. I found a few Elements Facebook groups. Not sure if they are officially set up and run by Adobe but I’m sure you could find help there. If you want more Elements education, you can find courses for it on Lynda.com, Udemy, and Creative Live. The only extra thing I could find that the Elements photo editing software can do it stitch a pano, and it did a pretty good job including filling in the edges that were missing bits of information. 3-image pano stitched in Elements. Panorama merged in Lightroom from the same three images for comparison. It can also do texture overlays as an added image layer, along with the blend modes and masking. It also has some neat things that you can do with your images like make a slideshow, a photo collage, Facebook cover image, a 12-month calendar, a photo book, and greeting cards. I did try the slideshow and it took a really long time to create one from about 60 raw files and there was no option to cancel so I had to wait. I didn’t try them all, but at a quick glance they look pretty cartoony stylized, and by that, I mean more like scrapbooking than a professional photographer would produce. They’re kind of fun, but not my own personal style. My overall impression of editing photos with Photoshop Elements is that it is most definitely aimed at beginners. If you've never used any photo editing programs before, I’m pretty confident you can figure out at least a few things to be able to enhance your images. If you’re a more experienced photo editor, you’ll likely find it a bit limiting and eventually outgrow it and want its big sister, full-sized Photoshop, or some other alternative like perhaps Affinity. From what I’ve seen I think Affinity is more suited to intermediate users than Elements. The biggest advantage of Elements that I see is that it’s like training wheels for Photoshop. If you plan on eventually going that route Elements will give you a good base, help you learn the ropes. Then when you graduate to Photoshop you’ll already understand some of the basic tools, and be able to find our way around a bit better. I think even if you decide to move to Affinity it’s a good start as well. I’ve said it a few times already, but I think Elements is a starter program for most photographers. It is missing some things which I believe are key and essential. But having said that if all you want to do are a few simple tweaks to your image, brighten it up, add contrast and punch, and adjust the color – I think it’s all you may need. 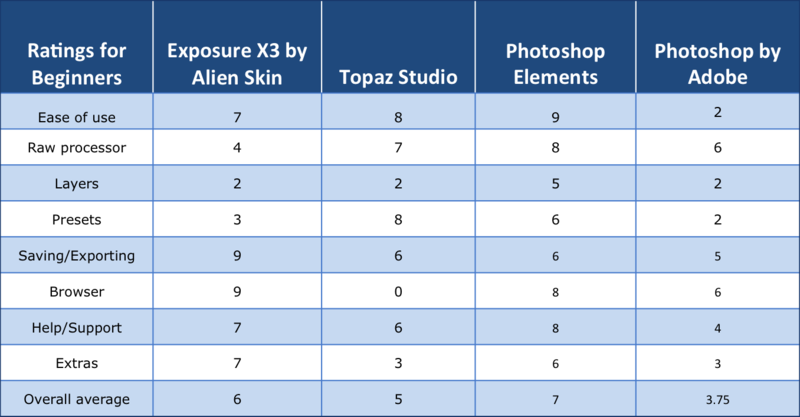 Okay here are the overall scores and specs on these four different photo editing software. My ratings for beginners – Click to view full size. My ratings for intermediate photo editors – Click to view full size. So which is the best photo editing software? The answer to that questions is complicated. It really depends on your experience level, how much you want to do to your images, and how much time you intend or want to invest learning the software. Then, of course, there is the monthly subscription issue – either you're okay with it, or not, but it's a factor. 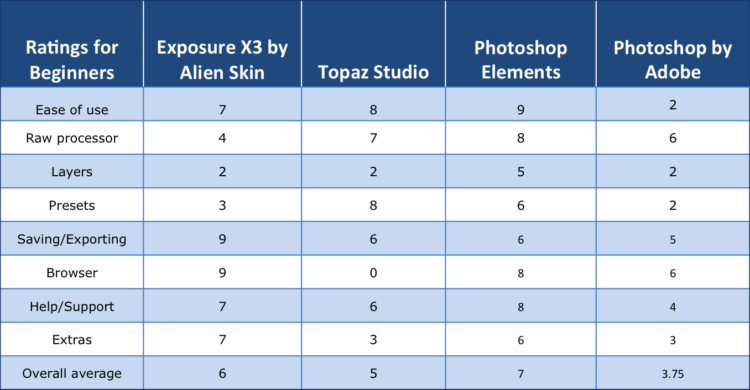 In this batch of comparisons, I would definitely put Adobe Photoshop CC on top for intermediate users, with Elements being the next closest option if you want one you can buy outright. Compare that to the results from Part One where Lightroom was on top and Luminar was a close second. For beginners, Photoshop Elements was the clear winner here, with Alien Skin's Exposure X3 close behind. Looking back on Part One, Luminar was ahead of the pack there. The neat thing is the Photoshop Elements might be a great option to get started, and if you find you have outgrown it, you still have other ways to expand your horizons. 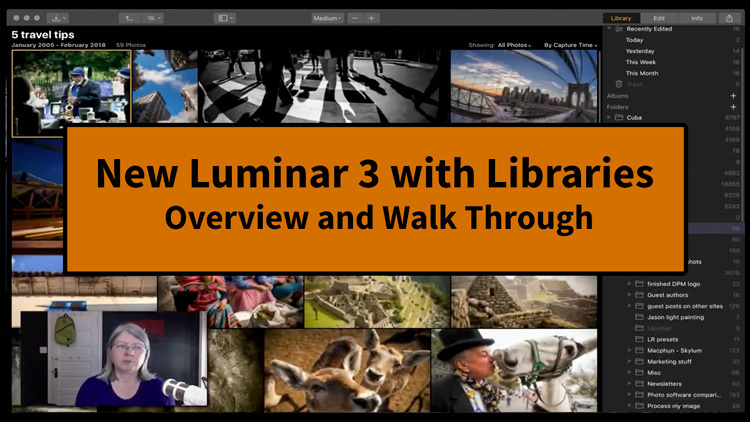 Elements works with some of the other programs, taking them on as plugins including On1 and Luminar. So if you want a more powerful editor without the subscription fees, you might look at those options. There will have to be a part three to this software comparison. So far I have these on the list – let me know if I'm missing anything else. I'm not including the free options, I will look at those at a later time separately. Give me your thoughts on this subject of photo editing software. Are you worried that Adobe is going to abandon Lightroom Classic and looking for options? Are you sticking with LR and PS but always interested in plugins and choices? Have you used any others I don't know about? Tell me what you think, where are you at on this? If you disagree with any of my ratings and assessments, tell me why. I've only just given each of these short a test drive, and I fully admit I could be missing things. So I want to hear from you. Let's discuss in the comments below.